Home » Website Building » Weebly » How to Add Audio in Free Weebly Site? How to Add Audio in Free Weebly Site? Weebly offers a very simple audio player as part of Weebly pro pack. Actually it is a HTML5 audio player which can be easily added with few lines of code and definitely there is no need for upgrading if you only want that audio player. There are many methods for Weebly free users to add audio to their site. In this article we will discuss the following methods to add audio in Weebly site. Insert audio using HTML5 audio element. Add custom audio player with playlist using embed code element. Embed audio player from third party sites like SoundCloud. Adding background music by modifying site’s CSS/HTML. Use premium Weebly audio player element. Upload the audio file to your Weebly site and add the below code inside an “Embed Code” element on the page where you want to add an audio. Replace the file URL with your Weebly audio file URL. Below is a custom audio player for your Weebly site without the need of upgrading to Weebly Pro. 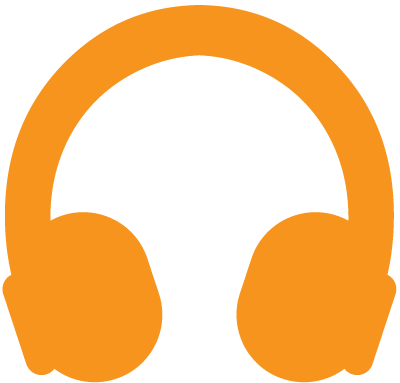 Go to any of the free audio player providers like SoundCloud. Click on the “Share” button and copy the widget or embed code and paste it in your Weebly site using “Embed Code” (Custom HTML) element. You can create your own playlist and use it in your Weebly site. Below is an example of an audio player loaded with playlist from SoundCloud. The player will get automatically updated whenever you update the playlist in SoundCloud. If you don’t want to use the external source code then you can add a background music to your free Weebly site by following the below two steps. In this way you will not see any audio player in your site but the music will get auto loaded when a visitor opens your page. Right click on the file and copy the URL of the mp3 file. If you want to add music to particular page then click on the “Pages” tab and select the page. Go to “SEO Settings > Header Code” section and add the following code. If you want to add background music to your complete site then paste the same code under “Settings > SEO > Header Code”. Weebly offers audio player element from pro plan onwards. 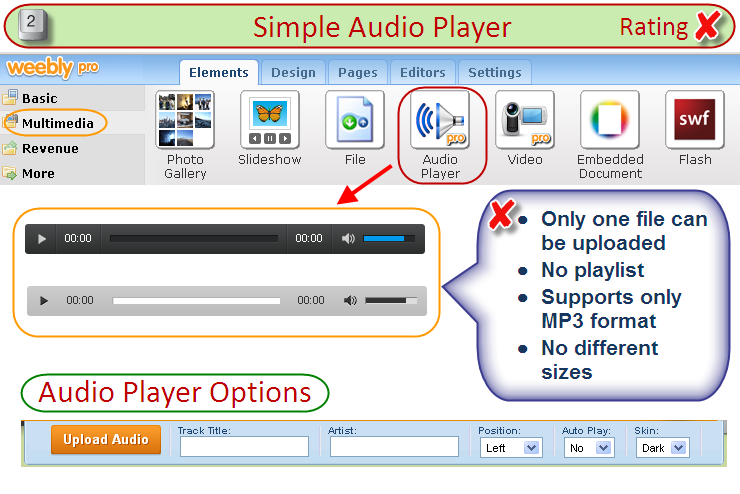 The default audio player is a simple tool to upload a single audio file on you page. Unfortunately this is not a comprehensive feature which can be used in a music sites and the free options explained above can be better option for you. The advantage of Weebly audio player element is that this is unbranded. In addition to above options you have play/pause button, seek bar and volume button in the player. By default there is no option to change the width of Weebly’s audio player. But you can use “Spacer” elements beside the audio player to adjust the width. Is there still way to upload a mp3 song on weebly starter package? I don’t see the buttons you’re referring to “Design” or “Assets”. Id like a song to play throughout the whole background without starting over every page click. How do you upload a m4a file? Tried using the above codes but they do not work for m4a files. We didn’t try with m4a, you should use mp3 or convert m4a to mp3 and use. How can I create a playlist with a shuffle button to randomly play tracks. We have an education website and students are answering interview questions. I want to be able to shuffle random songs so they can practice answering questions randomly. How do I upload the MP3 file? It is clearly mentioned in the article – Under “Assets” section click on “Upload Files(s)” option and upload your .mp3 audio file. so the background music works great but my friends told me that they cant hear anything when they go on so im wondering how i can make it so they can hear. The audio player works, but when clicking on the Track the item file does not load in the player, but actually takes you away from the page to a black page playing the file itself. How can this be resolved?????? The audio player works, but when clicking on the next item in the playlist, the file does not load in the player, but actually takes you away from the page to a page playing the file itself. How can this be resolved? Can you tell me how to set it auto play? into the Header Code box, then click Save & Edit the code is gone when I reopen the Page? If the first character “<" is deleted, the text does not disappear – thoughts? Hey, thanks for the help with this! It’s works great and is very simple. But I wanna know if there is a way to have the music play without restarting every time you click on another page on my site.